Just before Christmas, Taulman3D very kindly sent me a little parcel with some new materials to try, and this is the first post of my testing. I thought I'd start with the newest and least available material first, which is their new PLA filament. Previously, I've moaned about the clamshell bubble packaging in which Taulman3D supplied their filament in back in the day - I'm very pleased to see that they have ditched this appalling packaging, and moved to proper spools, which is a huge improvement. The spools size is smaller than my normal PLA/ABS reels, however sits nicely on the universal spool holder I've got. 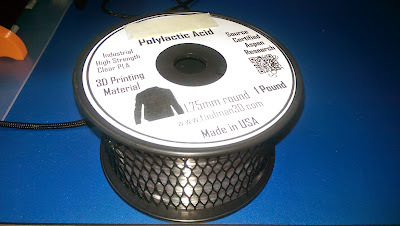 All of the recent rolls of Taulman3D material now come on these 1 pound (0.45kg) spools, so it seems they've adopted it for their entire product line, which is a great move on their part. I hope that they will keep tabs on the current movement to standardise material spool sizes which RichRap is championing. It would be nice to go metric though, and offer full 1KG spools of material...just saying! The other thing of note on the packaging side, is that they supply a very handy webbing to contain the filament. Given that the spools are tightly wound, and certainly in the case of Nylon products at least, it has a habit of springing away from the spool and potentially tangling, so this is a very welcome addition. The idea is that you leave the webbing on during printing, and the loose end feeds from behind the webbing, threading up from the top - this seems to work fine most of the time, however it does pop off the spool occasionally. This in no way affected any prints though, and I just push it back over the spool without issue even during the print job. Seeing as this is Taulman3D's answer to PLA material, and features low melting points of an advertised 205c with a low warp on larger prints, I decided to treat it as I would any other PLA right off the bat. The model I selected for initial testing was Loubie's Aria The Dragon which features several challenging areas in the print, including subtle surface details, bridging, some serious overhangs and a necessity to get the infill just right so that you don't get gaps in the curved portions of the print. I started off the first attempt at the recommended settings of 205c, with a bed temperature of 60c. As usual, printing on Kapton & Glue stick provided an excellent adhesion to the bed and I had no issues with prints moving or warping throughout testing. 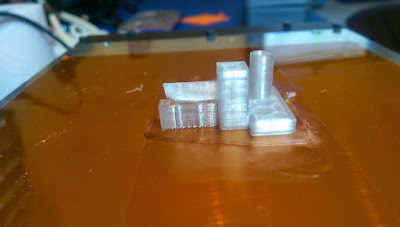 On the first attempt, I wanted to see how little infill I could get away with as this model is just crying out for an RGB LED to be installed in the base, and less infill means less drilling later. Yes, I could have asked nicely for the model to modify it properly for a lamp, but I thought I'd try this first. 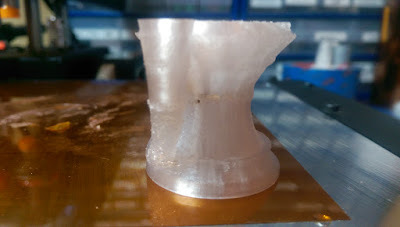 As you can see, I aborted the print midway, as I noticed that the lack of infill in the base had resulted in several quite noticeable holes around the bottom of the curved part of the plinth Aria sits on. 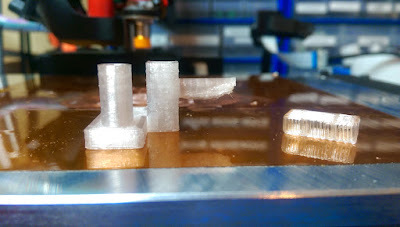 Also, the 5% infill pattern was very noticeable throughout the largely transparent PLA. 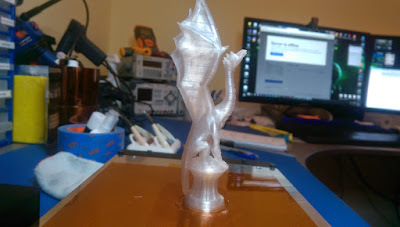 There are actually three top layers under the dragons feet here, but it looks like there is only one due to the transparency properties of the PLA. Oh the possibilities for arty internal 3D prints are springing to mind! 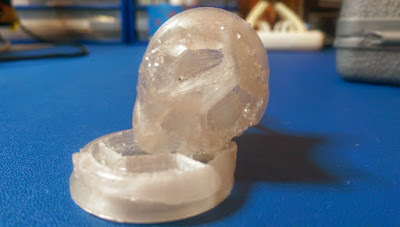 Once that print was aborted and I got the next attempt with a higher infill of 15% going, I thought I'd try a strength test, and basically pulled, pushed and twisted the model until it finally broke. Thin parts, like Aria's arms and legs where surprisingly difficult to detach, much harder than with other brand PLAs. I would say very unscientifically that it's tensile strength is around 20-30% higher than a normal PLA. Saying this though, it is a very brittle formula, and tends to shatter somewhat like a laminated glass, although only in the local area of the break. In fact after playing with this material for a while, including various tests of how to clean up surfaces etc, I had a fair bit of mess on the desk in the form of tiny PLA shrapnel. 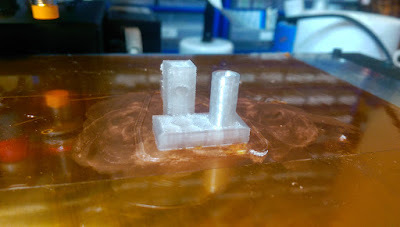 I tried a variety of temperatures on the hot-end and bed - 60c for the bed is perfect. In fact, on smaller parts I found that glue wasn't necessary on a hot Kapton surface. On the hot-end I ended up using 210c most of the time to help with layer bonding and good flow rates. 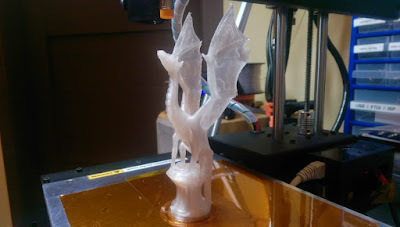 Print speed from 15-75mm/s didn't seem to bother it much either, but I ended up sticking at an average 30mm/s for most prints. One of the things I noticed almost immediately, is that a nozzle fan is required at all times if surface finish is a priority. 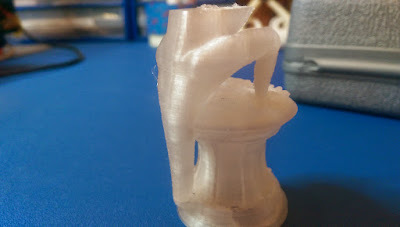 In the images here, you can clearly see at which point in the print I enabled the fan - the surfaces immediately become smoother and more glossy to the feel after the event. 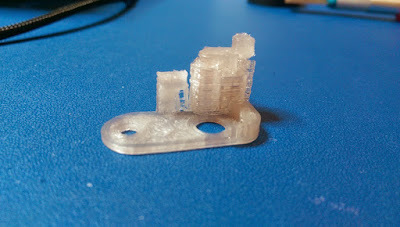 I also noticed that having a fan enabled allows much more surface detail to show through using this PLA. Just leave the fan on OK? One note about the surface finish using this, is that it's a bit strange to the touch - when comparing to other PLA's, it feels very smooth...but the only way I can describe it is...powdery. Its almost like there are millions of tiny tiny particles under your finger. There is absolutely no shedding, dust or particles coming off the print though, but it's a bit strange, so I thought I'd mention it. I've tried prints from 0.4mm all the way down to 0.01mm and all give the same slightly powdery feel to the finish. One big kudos on this material, is that very very little finishing is required on models - as you can see with Aria on the bed here, surface details are very strong, and with a nozzle fan running, there is virtually no blobbing or stringing. Any very minor ones that did remain, literally just brushed away - I didn't have to get the Exacto out once! I wanted to try a functional part in this material too, both with and without support materials, to see how it responded. First test was a very simple geometric model (a filament guide in case you're wondering), and it was extremely accurate dimensionally. I decided to try the same part again on it's side, with support to see how that fared. 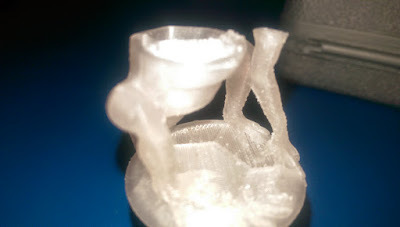 As you can see, the support is placed nicely, but the tube it's supporting is deformed at the end (on the left) The part would still have been usable, however it wasn't very clean looking. In all the support tests I did, even ones with heavy rafts and pillars, the support material was very easy to remove. 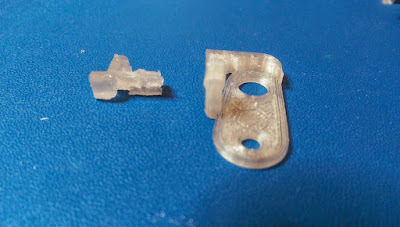 With a slightly more challenging part, again the support material came away clean and easily. However, being the brittle stuff that it is, on very thin parts there is still a good chance of breaking the model, which I did on this one. In conclusion, this is a nice material to work with. It has fantastic surface quality potential, and its water clear features make for some interesting applications with light and internal 3D structures that you want to show off within a model. In usage, the temperatures for printing are sensible and easily manageable on pretty much any machine available today. Even if you don't have a heated bed, just using Kapton and Glue Stick worked extremely well, with zero warping of parts. The only cons I see here are that because it's a strong material, people will be tempted to try and create industrial grade/strength parts - unless care is taken in the parts design, the materials brittle nature will likely bite you! Assuming it is accounted for, and strength is given to those areas using for example 15%+ infill and a minimum 2.5mm+ thickness for spread loading, then it should produce suitable parts. The other con is again to do with the brittle nature - this stuff got everywhere when I was breaking it and removing support and rafts etc - again, not a show stopper, but if you're doing your printing in the living room, you might want a dust sheet when you clean up your models!